In a new report, Elephant vs. Mouse, the International Fund for Animal Welfare (IFAW) and the Wildlife Conservation Society (WCS) uncover a robust trade in ivory and related wildlife products on Craigslist, a classified advertising online platform. Craigslist is a massive site, with 50 billion page views and 80 million postings added each month. IFAW and WCS surveyed postings from 28 cities over the course of five days in mid-March and found 615 elephant-related items, with a combined list price of $1.4 million. Over a full year, those 28 cities might therefore yield some 6,600 items, with a combined list price of more than $15 million. The report doesn’t say that the postings are illegal, but because only 3.4 percent (21 out of 615 items) offered any documentation or proof of provenance, it suggests that the system needs some way to tell what’s legal from what’s illegal. 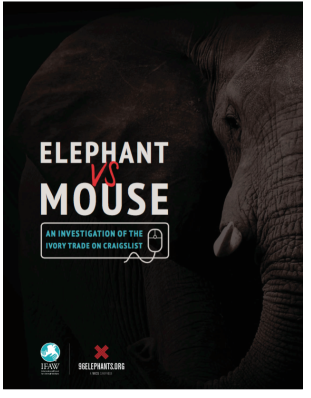 The sheer volume of trade exposed in this latest investigation of Craigslist is surprising, particularly as more states consider legislation to restrict commercial sales of elephant ivory and rhino horn. In many states, such as Vermont where the House Committee on Fish, Wildlife and Natural Resources is scheduled to vote soon on bill H.297 to restrict ivory sales, legislators wonder about the size of the ivory market. Additional surveys of the online wildlife trade by IFAW—including Killing with Keystrokes (2008), Wanted Dead or Alive (2014), and Bidding Against Survival (2014)—also showed continued commerce. This latest investigation into ivory on Craigslist underscores both the persistence and volume of the trade. A quick search of Craigslist for the city of Burlington, for instance, brought up five items with a combined list price of more than $15,000. On May 1, National Geographic spoke with report author Peter LaFontaine, IFAW’s campaigns officer. IFAW has a history of investigations, particularly of online sales. It’s really frustrating to hear retailers and auctioneers and even members of Congress insist that all the blame lies on China when the United States clearly has a broken system. Investigations like ours are not intended to show that all of the ivory online is illegal, just that the volume of commerce is substantial, and there aren’t many safeguards to prevent blood ivory from being sold openly. We’ve done some work with eBay, Taobao, and other major Internet platforms, and eBay has had a fair amount of success with their filtering software and other efforts that minimize illegal trade. Etsy.com decided last year to outright ban and wildlife products from the site, and that seems to be making a difference. We’ve been working with one of the big auction aggregators online, called liveauctioneers.com, to improve their practices, and they’ve shown a real willingness to change their model. Craigslist seemed to be one of the next big platforms that, in honesty, has some catching up to do compared to others in the industry. Craigslist is a huge platform. We only looked at 28 cities, which is a really small fraction of Craigslist’s 420 portals. But even so, we found over $1.4 million in listed ivory. That means that there may be a multimillion-dollar ivory trade on the platform as a whole. If you can find that within five days with five investigators, then you know that there’s much more out there that’s not being uncovered. The other major finding was about documentation. 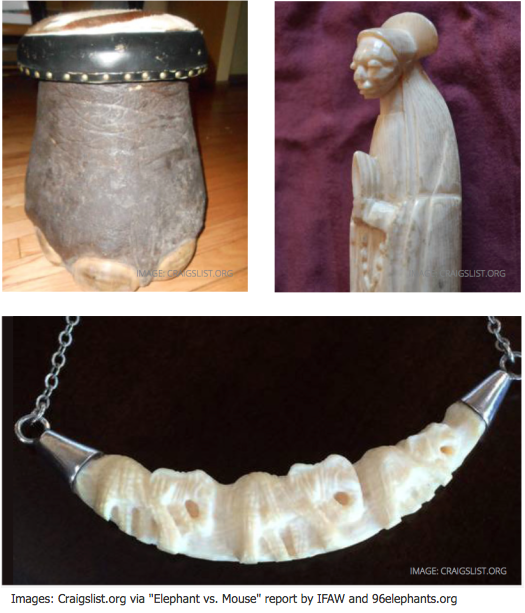 As it stands, you don’t have to prove anything to sell an ivory tusk or carving. Of the 615 items we tracked on the site, only 21 offered any documentation or proof of provenance. I do want to stress we’re not alleging any sort of illegality. But [the lack of documentation] just goes to show that the system needs reform. We need to have some way to tell what’s legal from what’s illegal. How might passage of state laws to restrict ivory sales affect Craigslist? It would depend on the wording. Unfortunately, a lot of the bills propose different exemptions, which makes it hard to say right now what law enforcement needs to look at. But we have this mounting body of evidence, of which this report is just the latest, which says we do have a problem. Now, what are we going to do about it? We contacted the company several times throughout the investigation. Their CEO, Jim Buckmaster, got back in touch with us shortly before the report was due. They’d definitely heard our concerns and added ivory and other endangered species products to their list of explicitly banned items, which was a good step, and we’re glad they took it, but the big takeaway for us is that enforcement on these platforms is really the key. Even prior to this investigation, Craigslist policy prohibited animal parts. But without better enforcement, what incentive does the seller have to toe the line? At this point, it’s about getting the laws in place. It shouldn’t be up to corporations alone to make the changes to protect elephants and rhinos and other endangered species. The White House is doing a pretty good job overall to raise the profile of the wildlife trafficking crisis, but you really need everything. We need more funding for anti-poaching and anti-trafficking, we need habitat protection measures, we need educational campaigns that show consumers why it’s a bad idea to buy ivory. Congress has to stop passing the buck. There’s a good bipartisan bill [the Wildlife Trafficking Enforcement Act] out there right now from Senators Dianne Feinstein (D-CA) and Lindsey Graham (R-SC) that would give additional “fuel” to law enforcement officers to prosecute serious wildlife traffickers. It should be an easy task to pass that legislation. We need others on Capitol Hill to step up. But instead we’re seeing new attacks every month from folks who insist they love elephants but really would rather protect the right of Americans to buy and sell a product that is driving this species to the edge. We need to change that situation before we can really hope to have an impact on the trafficking crisis.